Envision your home as separate from the outdoors—a great way to think of it is like your skin. Your skin is what keeps your insides in and protects your internal organs from outside exposure. Your home's structure is like your skin. It envelops you. It keeps your home safe, the components of it interacting with each other, not the outdoor environment. The walls, doors, windows, roof, foundation and insulation work together much like your blood and internal organs work together to cool you and to keep you warm and dry when you need to be. Home energy efficiency is a two-fold scientific system. Energy-efficient homes keep your home heating and cooling systems working together to keep you comfortable by using programmable thermostats, Energy-Star appliances and zone heating and cooling to regulate temperature. The second system, the outdoor environment, can be used to promote energy efficiency like clothing keeps your skin and body cooler or warmer. Landscaping choices, such as using trees to shade windows or to provide windbreaks promote energy efficiency. Insulation is one of the most important parts of your home. It keeps your home airtight; affecting both a sturdy thermal and a pressure envelope so that your home's heating and air-conditioning can do their jobs. If air leaks penetrate your building envelope that means that you could be losing energy and throwing money out the window. The key to energy efficiency is to maintain occupant comfort level, not to continually establish it. Let's go back to the skin analogy. In order not to get sick, your body must continually exchange carbon dioxide and oxygen through your respiratory system. It's not just breathing through your nose and into your lungs, but your pores. Your home operates the same way. If you stay indoors with everything closed up when you have the flu, the flu microbes recirculate through the air, reinfecting you. If your home is so tightly enveloped, it's tough for natural air exchanges to take place. Thus your home, on its way to energy-efficiency, can actually be polluting your environment—and your family's health. Carbon monoxide is one of the main culprits—and it can kill you without warning. Your home's energy envelope also helps reduce your energy footprint on the world. Installing air exchangers, Energy-Star appliances, storm windows and doors, weather stripping doors and windows, and caulking air leaks can lead to fewer emissions that can harm the environment, your health and your pocketbook. Check out these links to see how your home can benefit from an energy audit, using energy-efficient appliances, heating and cooling systems, lighting and landscaping design. What is the Building Envelope? : The building envelope separates “conditioned' space from “unconditioned' space—that is, the indoor space from the outdoor space. Building Envelopes Program: The famed Oak Ridge National Laboratory's Building Envelopes program looks into the structural aspects of buildings and the energy-efficient materials to do the job. Energy Analysis and Tools: Energy simulation tools for building envelope researchers and professionals. Energy Analysis Tools: For building professionals: to understand how the tools work is the key to making good choices on what computer energy analysis tool will best calculate energy consumption for projects. Passive Solar Home Design: Discusses how heat moves and is stored through conduction, convection, thermal capacitance and radiation. Elements of Energy-Efficient Housing: The thermal envelope shields your living space from outdoor elements and keeps your snug. HVAC Systems: Heating, ventilation and air conditioning collectively make up 40 percent of commercial building electricity use. Energy and Cost Savings Calculators for Energy-Efficient Products: Cost estimator calculators and fuel cost comparisons help you to determine yearly operating costs and where you stack up against comparable appliances and homes. Energy Efficient New Construction: How to integrate building components to create a high-performance home. Saving Water Energy: Your hot water system is one of the greatest energy users in your home. Bathroom Sinks and Faucets: WaterSense labeled faucets are made in conjunction with the U.S. Environmental Protection Agency. 2011 Energy Star Tax Credits: Double-check as not every Energy-Star product qualifies for the credit. Solar Water Heaters; Check to see if your power company offers incentives for you to install solar water heaters like Gulf Power does. Water Heating: Information on the different fuel choices and sizing for energy efficient water heaters. Farm Energy Options: How harnessing the sun's light and heat can energize farming communities. Compact Fluorescent Light Bulbs: Energy-Star CFLs last up to 10 times as long—but cleaning a broken one isn't a breeze—they contain mercury. CFL Mercury: Household FAQs about CFL bulbs and how to clean up a broken one safely. Wind Powered Turbines: Converting wind energy to electricity for residential homes. 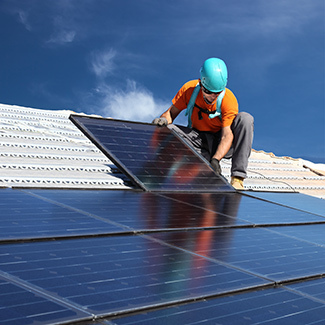 How Solar Cells Work: Overview, photovoltaic cells, solar-powering your home are covered—not every home has the correct roof angles. Energy Efficient Appliances: Residential appliance energy costs can add up quickly—running a refrigerator for 20 years can cost you three times its purchase price. Energy-Star Appliances: Why are there two price tags? One is the purchase price and the other is its projected lifecycle cost. Energy Efficient Appliance Credit: Cornell University Law School addresses the legal side of the appliance credit. Energy Appliance Tips: Regular maintenance is key to maximize energy appliances' efficiency. State Rebates: Find energy efficient appliance rebates in your state. Landscaping for Energy: How landscaping your home is more than appearance, it's about maximizing your home's environmental sustainability and energy efficiency, especially in winter and summer, the seasons notorious for extreme weather. Quick Facts on Energy Landscaping: Geared toward Florida, but with tips for any region. Note that careful planning and maintenance is paramount to any landscaping energy design. Energy Saving Trees: How to lay out your tree landscape for maximum summer cooling and maximum winter heating. Passive Solar Design: Natural cooling guidelines cap off this list of tips on how to use solar energy effectively for your home.